Single; large, opens light pink, the color distributed in pink flecks, less concentrated toward the center, over the greenish white background, a distinctive color effect. Light fragrance. Vigorous, dark green foliage on a stoutly erect, medium height bush. Outstanding in flower and plant habit. One of the finest in the garden and on the show table. Species cultivar, P. lactiflora.�Parentage: unknown.�Origin uncertain, possibly H. P. Sass, about 1950. 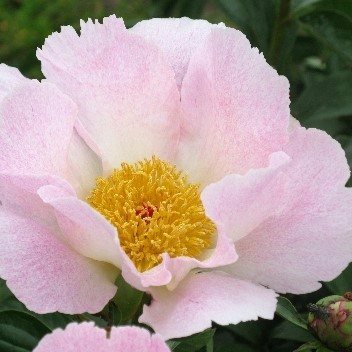 For many years in commerce as 'Dawn Pink', the name reserved to a Sass peony introduced about the same time. Pollen and seeds, proven parent.